nice. Thats kkinda what mines going to look like. I know but I really like the look of the ll frame. What are the pros/cons of rounded/nonrounded crowns? I will post my uni soon. Almost stock. 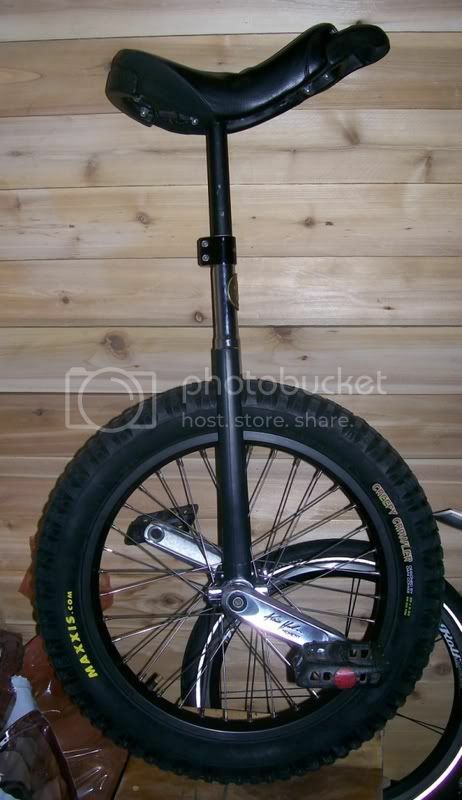 The design supports the philosophy of simplicity inherent in unicycling. Some may argue aesthetics though I think they are cool in a rebellious way - reject the norms, woo! Strong potential for personal injury during SIF riding or unispin type tricks when pedals are missed. Please fill in anything I've missed or debate any points I've made. Newest Video: Hitting jumps on a 36er! Get cool unicycle posters, pins and more! Last edited by Brian O.; 2008-01-02 at 09:55 PM. Find More Posts by Brian O.
interesting. Thanks so much for the time you took to write that up. good luck lacing it!!! are you doing it youself?, if so, all the luck to you man. sounds like an uber sweet uni you have on the way!! Last edited by oneisenough; 2008-01-02 at 11:38 PM. another problem with the nimbus 2 style (and only the nimbus 2 style) is that with flip tricks its really easy to rip the bottoms of your pant legs. happened to me many many times. I agree that rounded looks better! Not very custom, but here's mine. Nimbus trials isis, KH moments 125mm and twisted pcs. No I am having my b*ke guy do it for me. I dont even know how to lace rims and I dont want to spend the time that way when I could be uni-ing. Its just to match the yellow everything else. Last edited by UniDudeDX; 2008-01-03 at 03:06 AM. ahaha, yeah. I broke my pants too. That why I (most of the time) ride with shorts. Last edited by Émile5; 2008-01-03 at 03:19 AM. My legs rubbing against the frame pretty much rubbed the decals off, I wanted to paint it, but knew that would rub off too eventually, so out came the tape. I kinda like the two tone look too, I'll have to think of a more stylish way to do it when the tape wears off.